When I learned that Kotobukiya had a licence to produce a Bishoujo Statue series for DC, I was in two minds. As I'll be posting about shortly, I have recently re-started collecting the DC Direct Ame-Comi series, and while these are quite different in the concept behind them, I don't know that I need to collect two Anime-styled lines of the same characters. However, Koto's opening character was a Barbara Gordon Batgirl, the very same character that sucked me into the Ame-Comi line! While in comics terms I actually prefer Babs as Oracle, I'm a sucker for action figure and statue representations of her former costumed identity, and so the die was cast. My first reaction to unpacking the Batgirl figure is that the DC Bishoujo series seems as though it's going to be on a slightly larger scale than its Marvel counterpart. 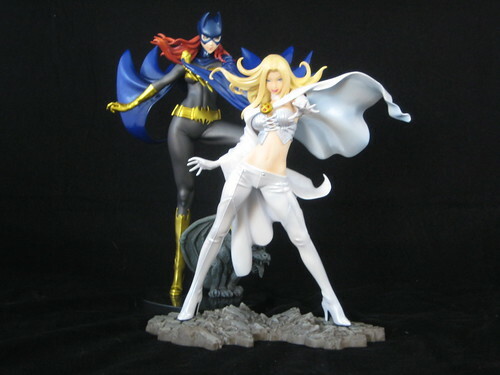 My first photo is of Batgirl and Emma Frost together, not a Photoshopped version, so you can see the comparison for yourself. I'll need to see the next release to fully judge this, but it's not a higher or larger base, so either Batgirl's legs are exceptionally long, or the actual scale of the figure is a bit larger. If this is the case it's a bit of a disappointment, as I for one wouldn't mind mixing and matching the two sets. Apart from a potential concern about the proportions, this is a very nicely sculpted piece. I like the pose, the flow of the cape and the headsculpt in particular. One odd thing with my particular statue is that the right leg was slightly coming loose at the join with the boot just below the kneecap. It wasn't a break and was easily fixed with a bit of glue, but it's something to watch out for, and the first QC issue I've ever had with a Bishoujo piece - which you would expect to be pretty resilient since they're made from PVC. She's also just the tiniest bit top heavy due to the width and breadth of her cape. Her base is a black plastic disc with a very standard Gargoyle - a favourite base for Bat-family busts and statues! The only thing I'm not sold here is the choice of paint. There's a metallic edge to the colours here, which to me is an odd choice. I also think the choice of the blue and grey are both a bit dark. One thing that to me marks a piece as anime-influenced is brighter, flatter colours. It may just have been an artistic touch, but I feel it detracts a bit from the piece overall. Much like with the scale, I wonder if this is a choice designed to set the DC line a part from the Marvel line. While I do like this piece and love the character, I'm not totally sold on the DC branch of the Bishoujo line at this point. I've already pre-ordered the Wonder Woman piece which is the next to come out in the DC branch of this line, and from that I'll make a decision on whether or not this is something for me. I have no reservations whatsoever about the latest entry in the Marvel Bishoujo line: the amazing White Queen turned X-man, Emma Frost. This statue is now vying with Phoenix for the spot of my favourite statue in the line. Sculpt-wise, this is pretty much perfect. The wide stance, outstretched arm and flowing hair and cape are all excellent. It's certainly the most dynamic of the Marvel Bishoujo statues to date. I'd imagine that an all-white costume is a challenge to work with in a piece like this, and I have to give Koto full marks for handling it extremely well. There are shadings used here, particularly in the underside of the cape, that give a sense of depth, but not at the sake of the costume actually appearing white. This was a slight disappointment for me with the recent Bowen Designs Emma Frost statue - the effect used basically made her appear more like the Silver Queen - there wasn't really any white to be seen! This is all topped off with a nice finish - not completely flat, but not metallic, that makes me all the less convinced that the paint choices for Batgirl were the right ones. I have sometimes given the bases on these pieces lower marks, as they can be unimaginative (Rogue's plain wait steps) or intrusive (Psylocke's giant pink "X"), but there's no such concern here. While this base doesn't have the magic of an integrated concept such as Phoenix's flames, or my favourite, Scarlet Witch's cape, its good looking and has a thin footprint, which allows some creativity in displaying it alongside other pieces. Nice work! All up - great new additions to my ever-expanding collection of anime-styled superheroines, but while I'm certainly dedicated to the Marvel line, Kotobukiya needs to hit it's next DC superheroine out of the park for me to keep going. You can see more pics of all my Marvel Kotobukiya Bishoujo Statues at the AFB Facebook Page, discuss this at the AFB Forum, and enter the January AFB Comment of the Month Contest by commenting on this post. Not a fan of the style, but that Batgirl looks great! 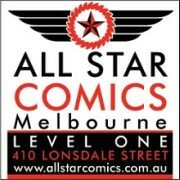 I'll need to set aside some cash to get that Emma Frost statue. Really should have put it on pre-order... Glad I did so with the Catwoman one. So far the line (both Marvel and DC) has been hit or miss with me. I love the way Emma, Rogue, Catwoman and Wonder Woman look, but Psylocke, Batgirl and Supergirl look odd to me. Thanks for the review and pics, they look great. I've been sort of put off the Batgirl figure from the solicitation photos, something about it looked really strange, but seeing your pic I think it's just the angle made her look weird to me. 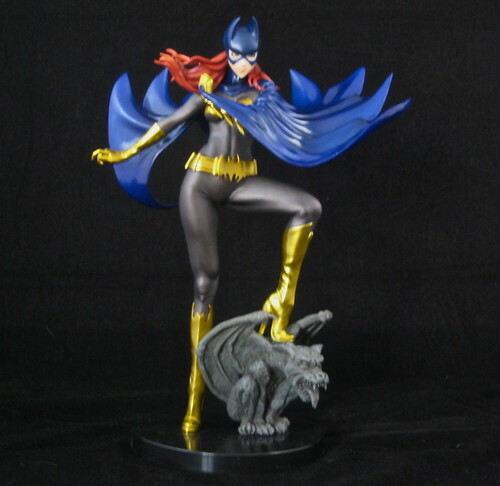 I very much like my Batgirl statue, though I still don't think tis line will be an automatic get everyone for me. Disappointing about the QC issue you had, I've not seen any yet. God I love this line so much. Need more money. I'm now flicking through your posts on this series and I quite like them. This is partly due to the shiny look and partly cos they are closer to the comic costumes. All in all, pretty nice!